Let the music begin. Amen. Photo © Bildbändiger. Concerts celebrating the 60th anniversary of musique concrète and the 50th anniversary of the founding of the GRM. The collaboration between Inventionen and the GRM is not the first: the GRM has been invited several times in previous years. Venues for concert performance of the works included the Kirche St. Elisabeth and the Wave Field Synthesis Hall, located in the main building of the Technische Universität Berlin. 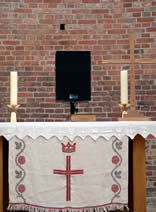 Installations were presented in the Villa St.-Elisabeth, next to the church. 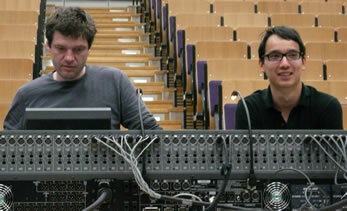 Thomas Schneider (TU Berlin) and Philippe Dao (GRM, Paris) spent many long days making sure the events went smoothly. Photo © jef chippewa. 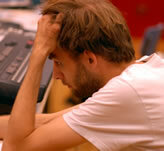 Folkmar Hein, one of the Inventionen coordinators and Director of the Electronic Music Studios of the TU Berlin. Photo © Bildbändiger. 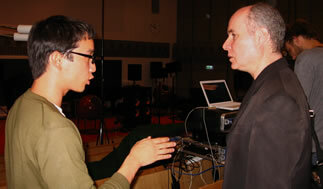 André Bartetzki (m) and Philippe Dao (r) preparing a setup for Douglas Henderson (l). Photo © Bildbändiger. Wilm Thoben solving technical “issues”. Photo © Bildbändiger. 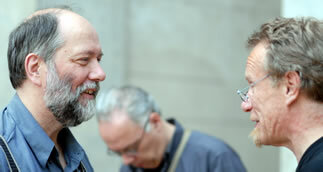 Philippe Dao (l) and Gilles Gobeil (r). Photo © Martin Bédard. Folkmar Hein (l) with “Team France” — Daniel Teruggi (m), Philippe Dao (r) and François Bonnet (fr) — on the steps of the Kirche St. Elisabeth. Photo © Bildbändiger. Folkmar Hein (l), in a friendly discussion with Patrick Kosk (r). Agostino Di Scipio in the background. Photo © Bildbändiger. 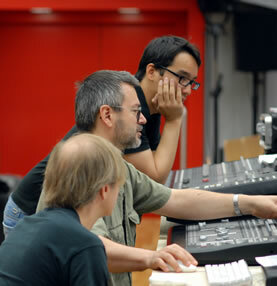 André Bartetzki (l), Gilles Gobeil (m) and Thomas Schneider (r) setting up for Gobeil’s Castalie, commissioned by Inventionen for performance using the three available systems simultaneously: Wave Field Synthesis, KlangDom and the GRM’s Acousmonium. Photo © jef chippewa. 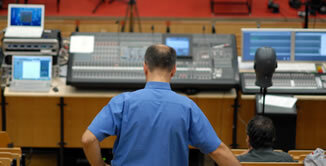 Hans Tutschku checking the Wave Field Synthesis system during the rehearsal of Zwei Räume. Photo © Bildbändiger. Kuhn solo. Kuhn trio. Photos © Martin Bédard. 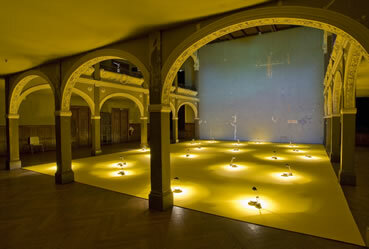 Hans Peter Kuhn — undefined landscape 2 (2008), sound and light installation [speakers, electronics, carpet and lights]. 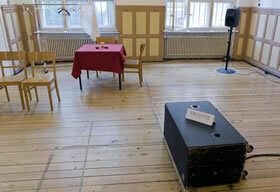 Upstairs in the Villa Elisabeth, delicate sounds emanated from the numerous speakers spread around the floor. The best place to listen seemed to be lying on the floor, where you could follow the points where delicate percussive sounds appeared, or simulated movement as different point-sources faded in and out. Photos © Roman Maerz (top) and Martin Bédard (bottom). 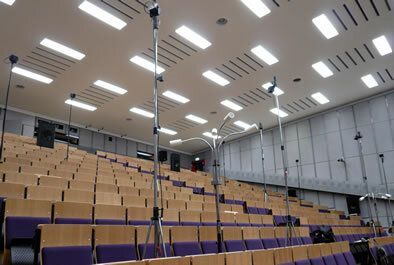 Composers selected one or more of the three available systems for the diffusion of their work in concert: the Wave Field Synthesis system permanently installed in the Technische Universität Berlin, the GRM’s Acousmonium and the KlangDom, developed at ZKM. The Acousmonium was set up for the first five days of the festival at the Kirche St. Elisabeth before it, along with the KlangDom, was moved into the WFS hall for the remainder of the festival. View of entire stage with the WFS panels along the back wall. The Acousmonium is spread around the stage. Photo © jef chippewa. Computer screen showing the control system for the WFS. The small coloured dots in the middle of the room are programmable “sources” for the signal, and can be used individually or in in multiple configurations. Each point will be programmed in a different manner and can be assigned different sources, or the same source as the user desires. 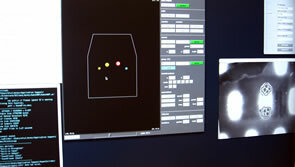 On the right, the x-ray-ish looking thing is what is seen by a camera mounted below a glass surface upon which sensors can be moved to allow manual control of programmed sources. The camera picks up the movement and this movement is translated into movement — spatialisation — over the WFS system. Automated movements can also be assigned to the sources, or trajectories can be programmed by “drawing” them manually using a mouse. Photo © Martin Bédard. The WFS system is made up of 105 units containing 26 loudspeakers distributed over eight channels, for a total of 840 channels and 2730 loudspeakers. Each unit is identical, and they surround the entire audience on all four sides, creating a continuum of point sources. (The black speaker is part of the Acousmonium.) Photo © Martin Bédard. 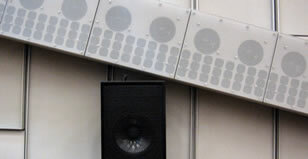 The GRM’s Acousmonium is a modular system that can be made smaller or larger according to the needs of the event or the limitations of the listening space. 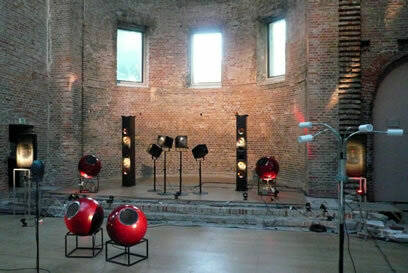 For Inventionen, a circle of 8 loudspeakers around the performance space and a smaller circle of four “trees” was complemented with a number of “specials” situated in the general front area of the performance space. 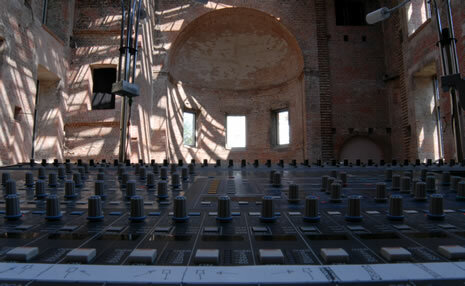 A view from the console of the performance space in the St. Elisabeth-Kirche (bottom) and a closer view of the stage-based elements of the Acousmonium (top). Photo © jef chippewa. 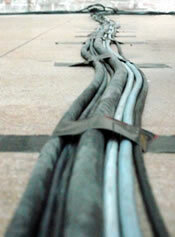 The “trees” of the Acousmonium are speaker units built by the GRM. 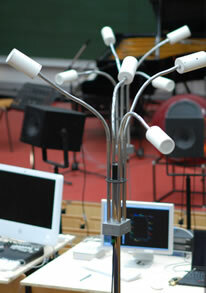 Each of the four “showerhead-like” elements on each tree contains a speaker, and angle and position of each “branch” is adjusted to assure an irregular distribution of the sound. Photo © Bildbändiger. 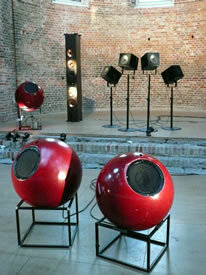 “Les Boules” are also “special” components of the Acousmonium which were custom-made by the GRM. Photo © jef chippewa. KlangDom. The small black speakers are set up as three concentric circles surrounding the listeners: the outer circle is made up of 8 UPL 1’s,the middle circle of 8 Meyer MM4’s and completed with an inner circle of 4 Meyer MM4 set up actually more or less as in quad. In the middle of the photo, one of the Acousmonium’s “trees” can be seen. Photo © jef chippewa. 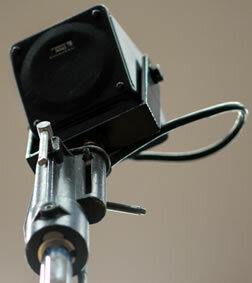 Close-up of one of the KlangDom components. Photo © Bildbändiger. Late afternoon light in the Kirche St. Elisabeth. Photo © Bildbändiger. At what point can we call it music…? Photo © jef chippewa. Disclaimer: no artists were harmed during the making of this photo series. 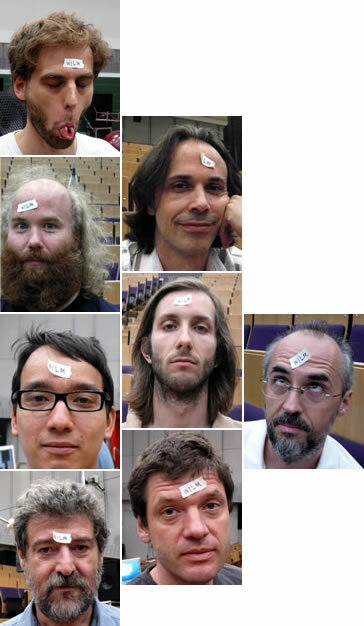 Wilm Thoben (top left) with (downwards) jef “Wilm” chippewa, Philippe “Wilm” Dao and Daniel “Wilm” Teruggi; in the middle Ricardo “Wilm” Climent, François “Wilm” Bonnet and Thomas “Wilm” Schneider; and on the right Fernando “Wilm” Lopez-Lezcano. Canadian composer jef chippewa is particularily interested in questions of cultural awareness and identity in regards to the composer’s responsibility in inheriting or appropriating cultural heritage. His compositions have been performed in such concert series and festivals as EuCuE, Darmstadt, FUTURA and the ISCM World New Music Days by groups such as ensemble recherche and asamisimasa. He is currently working on a new composition commissioned by Trio Nexus. 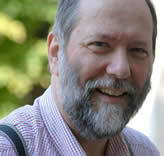 Since 2005, he is the Administrative co-Director of the Canadian Electroacoustic Community, Canada’s national association for electroacoustic music.